Hi, my friends - this time I'm going to explore the Science Fiction side of wargaming again, with a little known game by West End Games...or should I say 3 games? 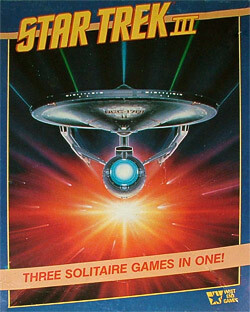 I'm talking about Star Trek III, a collection of 3 solitaire games that was published in 1985, when "Star Trek III: The Search for Spock" came out in the cinemas. This was a good time for Star Trek fandom and probably also the height of Star Trek related boardgames. West End Games, which doesn't exist anymore but which was in the upper league of boardgame and roleplaying publishers at the time, had just acquired the license and published quite a lot of Star Trek related games in these years, among them a role playing game, a paragraph-based adventure game, a family game, and this little gem, which you can just still get for reasonable prices on eBay. For some reason the high concept was apparently: it's called Star Trek III, so let's have three games. And Spock was left alone in the coffin on that planet, so let's just imagine these would have been games he could have played by himself. Ok, I was making up the latter, but solitaire games they are. The authors involved were Greg Costikyan, John M. Ford and Douglas Kaufman. Greg Costikyan was probably the author most experienced in both solitaire games and wargames by that point - he had worked for SPI as a youngster and then moved on to bigger projects, many of them wargamish. He would later design "Dark Emperor" for Avalon Hill, a game about which I might talk at some later point. John M. Ford was a noted SF author and had also - together with Costikyan - heavily contributed to the very successful roleplaying game "Paranoia". Doug Kaufman had only designed one boardgame so far, which was "Web and Starship", a today little known space combat game. I won't go on at length about two of the games of that collection - they are neither wargames nor are they good games at all (which is not necessarily connected). 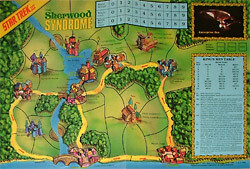 The first is called "The Sherwood Syndrome" and has Captain Kirk help out an oppressed medieval planet as some kind of Robin Hood with his merry men in red shirts about to be killed. This is some kind of paragraph driven/boardgame hybrid by Greg Costikyan that simply does not work and feels like a hack job. Once you get the hang of it, the game is ridiculously easy to beat. The game is only notable for giving Lieutenant Uhura a higher money extortion rating than both Sulu and Chekov, which probably means she is some mean piece of...ok, this is a family friendly article, I guess. 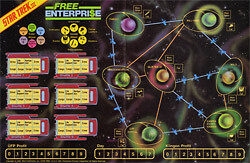 The second game is the endlessly boring "Free Enterprise", designed by John M. Ford and again Costikyan, which has you move some shuttles around a tiny planet system, hoping that the wares you try to sell are in fashion on this and that planet, which is - as you would expect in a bad game - decided in a totally random fashion. So nothing to write home about, forget these 2 games. 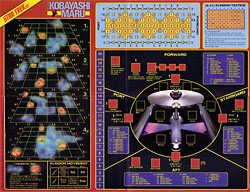 But the reason I actually talk about Star Trek III is its main game, The "Kobayashi Maru", designed by Doug Kaufman, which is an absolute gem of a game and one of the best solitaire wargames ever designed, period. Only for this game you should scrounge eBay for a copy, believe me, it is worth it. "The Kobayashi Maru" is the name of the famous supposedly unbeatable Starfleet Academy simulation for aspiring fleet officers. It was only beaten by one person in the history of the academy, and that is Captain James Tiberius Kirk. And he cheated because he hacked into the computer. This training simulation features at the beginning of the best ever Star Trek film, "The Wrath of Khan", and it would probably have been better to release this game alone under the name of the second film, as it would have had a much bigger audience. In this game which accurately tries to portray the simulation from the film you try to lead a rescue mission in a Klingon neutral sector of space. You will be confronted with the hard task of surviving this test with your wits and combat ability alone. You are outnumbered and badly armed compared to the Klingons which were probably pretty angry at the time because they suddenly grew strange ridges on their foreheads. The Neutral sector is depicted as a 3-dimensional map board in three layers, so you can move up, forward and down. At the beginning of the game some unknown counters called readings are placed on the map and the Enterprise somewhere randomly. During the game you try to explore the sector and complete your rescue mission without getting into fights with Klingons, which is of course pretty impossible. The readings, which are blips on your space radar, move around in a randomized fashion on the main board, once they hit your space they are revealed as what they are, and this is where the fun begins. The biggest part of the board is a large scale depiction of the Enterprise fully crewed with our heroes, each at their usual position. So you will find Sulu at the helm, Uhura at the communications desk and Spock at the computer. You even have some kind of view screen - this is where the enemy ships appear and move around in a fashion that is determined by a complex Klingon tactics chart. Once combat begins it becomes very similar to the also excellent solitaire game "Patton's Best", which depicts tank warfare in the Second World War. You try to bring your weapons to bear against an opponent which constantly changes tactics and moves around pretty intelligently. The enemy will fire at your ship as well - if you turn to the right all enemies on the screen will move to the left, and vice versa. You will always have to judge where the opponent most possibly moves and stake your odds while using the best possible weapons. At the same time the Enterprise's shields get more and more damaged, and you should try to avoid showing the weak side to your enemy. All in all, this works pretty ingeniously - there are some tables and not too complex mechanics, but they never distract you from actually feeling yourself right in the command chair of the Enterprise. Later computer games have successfully attempted to convey this feeling, but it was never realized as intelligently and elegantly in a boardgame as here. Once you have your first engagement behind you, you will start to pray not being caught by a Klingon patrol again, but of course it will happen, and like a submarine in World War II you will be confronted with mines and torpedoes and other evil gadgets of the Klingons, as well as space clouds and asteroids. There are several levels of play which range from fairly easy to absolutely impossible - the latter is the closest to the film Kobayashi Maru test, and it can only be beaten if you fudge your dice. The game doesn't take that long and can be played again and again. All in all this really is a great game, and if you have any interest in the subject you should give yourself a treat and buy it, it really is a wargamer's science fiction game. I hope I have wetted your appetite, see you next time when Scott talks Jason into a 24-hour marathon session of Advanced Squad Leader... without reading the rules first... .